Take a stroll through our farm stand and discover a wide variety of locally made products. You will want to bring home a delicious jar of jam, honey or maple syrup, along with a fresh apple pie or chicken pot pie for dinner. Local products are always available for purchase in our farm stand, where shelves are stocked with many imaginative country gifts and goodies. 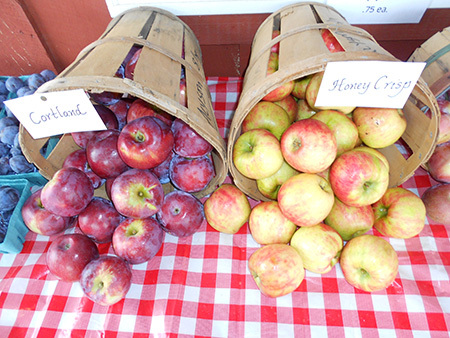 Purchase your pick-your-own bags here or buy a bag of pre-picked apples to take home. Many brides choose to be married at Alyson’s because they so enjoyed their family apple picking outings while growing up in this area. Others have told us that this orchard cannot be compared to another because of the beautiful vistas and the abundance of fruit to be picked. Alyson’s Orchard is more than a pick-your-own orchard; it is a family tradition, and an experience your whole family will remember for a lifetime. Our farm stand is open seasonally from mid-July through the end of late November.